The Walker Award winner for 2018-19 is Mary Lofton. Mary is a 3rd year Ph.D. candidate in Biological Sciences studying limnology. 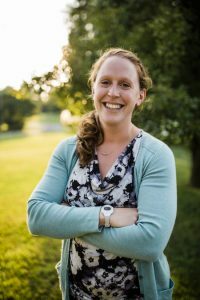 Prior to her graduate work at Virginia Tech, Mary worked as a high school Biology and Environmental Science teacher, and was drawn back to graduate school in the aquatic sciences because of the unique potential of freshwater science to ignite enthusiasm in young people and bring communities together. Currently, she is studying the effect of climate change and different management strategies on phytoplankton communities in southwest Virginia drinking water reservoirs. Established to honor the late William Walker, the founding director of the Virginia Water Resources Research Center, this award has been given since 1999 to recognize and support graduate students in water resources who are pursuing work in a field different from their undergraduate study, or who have returned to school following a period of professional work. More information about this program is available here.